How many Units (400 gram)? Vitamin C: If it's Good For Gorillas Why Not Us? Linus Pauling, twice a winner of the Nobel Prize warned for years that North Americans suffered from marginal scurvy. Humans and gorillas, unlike other animals, cannot manufacture vitamin C. Pauling says, that’s why the ship’s cat, who could manufacture vitamin C, survived long sea voyages and sailors died. Pauling believed that marginal scurvy can result in coronary attack. 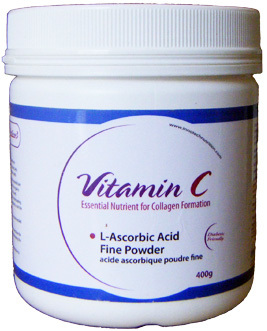 Vitamin C is required for your body to manufacture collagen. Just as mortar holds bricks together, collagen is the glue that binds cells together. If the glue is faulty, cracks and rough edges occur in coronary arteries, setting the stage for atherosclerosis. As well, coronary arteries are under greater stress than other arteries since they are anatomically closer to the beating heart. This constant pounding injures the arterial wall and triggers atherosclerosis. High cholesterol, is not the primary culprit of heart attack, says Pauling. Also food for thought is why gorillas in captivity are given 5,000 mg of vitamin C daily. Yet the recommended dose for humans is a mere 60mg! 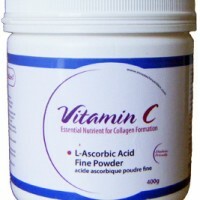 Vitamin C is a powerful antioxidant and fights the waste products of metabolism. This helps to decrease the risk of aging problems. For instance, several studies show that vitamin C has a major effect in decreasing the risk of cataracts and also helps to fight arthritis. Pauling died at 93 and took 18,000 mg of C daily. But such high doses can cause diarrhea, troublesome to some, so C is also a good laxative. Q. How do I use this Vitamin C powder? A. Just add a scoop to diluted Grape Juice, Apple Juice, Pomegranate Juice, Orange Juice or water and let dissolve. Go from 60 mg Vitamin C to 2000 mg per cup. Great for everyday use! Remember, we do not make our own Vitamin C, so be sure not to forget this vital nutrient in your daily regime.